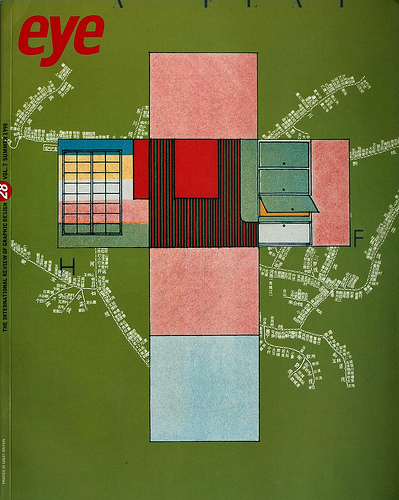 Cover of Eye 28: A plan from a 1937 Architectural Review plus a Chinese typographic railway map. Design by Nick Bell, 1998. Opening spread from ‘Reputations: John Plunkett’ in Eye 28. 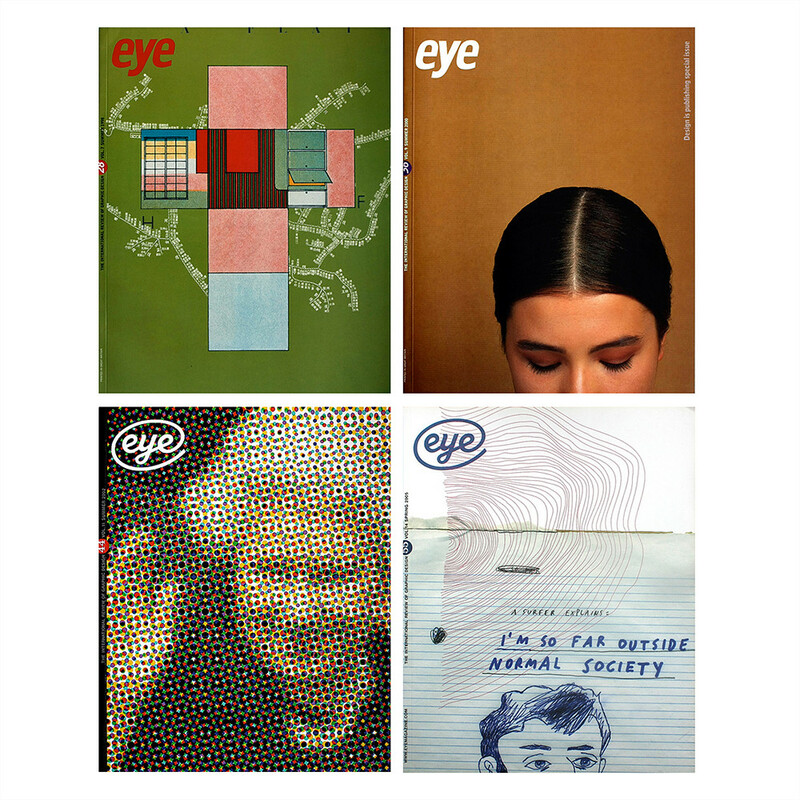 Eye 28 (1998) was edited by Max Bruinsma, and includes Richard Hollis’s article about the Architectural Review plus pieces about The Museum of the Ordinary, Fotonovels and an interview with John Plunkett, the original art director of Wired magazine. 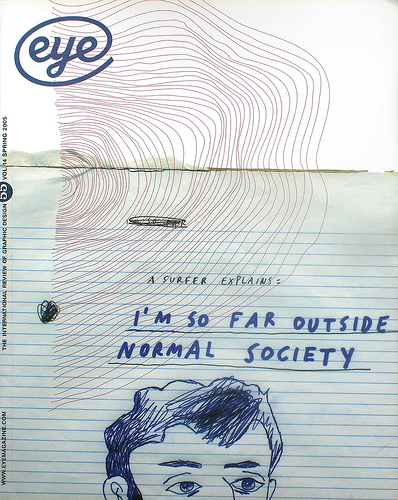 Cover of Eye 36: Photograph by Anthony Oliver. Design by Nick Bell, 2000. Eye 36, the ‘Design is publishing special issue’ profiles Fernando Gutiérrez, includes ‘Not browsing but reading,’ Adrian Shaughnessy’s critique of early e-books and has a Reputations interview with Lorraine Wild, plus reviews by Judith Williamson and Ray Roberts. Cover of Eye 44: Detail from the front page of The Daily Telegraph, 5 April 2002. Design by Nick Bell, 2000. Eye 44 (2002) was our newspaper issue, which included an article about the way the New York Times dealt with the aftermath of 9/11; Simon Esterson’s ‘Kit of parts’, about the design of newspapers; and ‘Big subject, little pictures,’ about the work of comic book artist Joe Sacco. 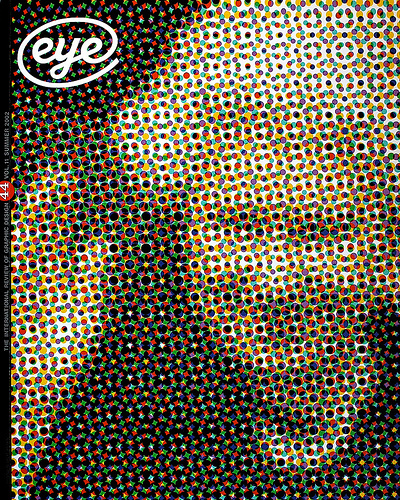 Cover of Eye 55: Detail from Surfer portrait by Paul Davis, commissioned by designer David Carson for Big magazine, but not used, 2001. Doodle and design by Nick Bell, 2005. 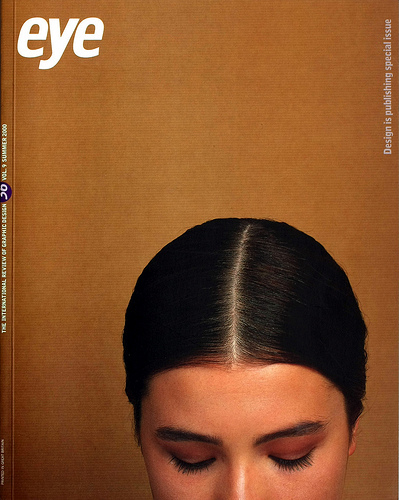 Eye 55 (2005), with a detail of a classic Paul Davis drawing on the cover, includes Val Williams’ comprehensive overview of the phenomenon of ‘found photography’, reviews of the First Islamic World Poster Biennial and ‘Communicate’ and a profile of illustrator Davis by Communicate’s curator Rick Poynor. You can buy all four issues for the bargain price of £45. There are also four other bundles in the ‘classic collections’ including ‘Back to the 1990s’, ‘On and Off the Wall’, ‘The Big Picture’ and ‘Type and Lettering’. Please go to the Eye shop on the ESco website here and order your bundle while stocks last.